James Louis McCartney (born 12 September 1977) is a British musician and songwriter living in London. He is the only son of songwriter and former Beatle Paul McCartney and Linda McCartney. He has contributed to a number of solo albums by his parents, including Flaming Pie (1997) and Driving Rain (2001) by Paul McCartney and Wide Prairie (1998) by Linda McCartney. He has released two EPs and two albums, the second was released on 6 May 2016. James Louis McCartney was born in London on 12 September 1977. He is the only son of songwriter and former Beatle Paul McCartney and Paul's first wife, Linda McCartney. 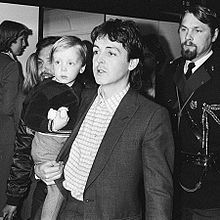 He was named after both his paternal grandfather Jim McCartney and his father, whose full name is James Paul McCartney, as well as Linda's late mother, heiress Louise Linder Eastman. He spent the first two and a half years of his life on the road while his parents toured with their band Wings. After the band broke up in 1980, the McCartney family settled in Rye, East Sussex. He attended the local state secondary school, the Thomas Peacocke Community College. He has stated his earliest inspiration to learn guitar was Michael J. Fox in Back to the Future. He began playing music when his father gave him a Fender Stratocaster at age nine. The guitar had previously been owned by Carl Perkins. In 1989, McCartney, with his older sisters Mary McCartney and Stella McCartney, again joined Paul and Linda on a world tour. He continued his education with a tutor while on the road. In 1993, at age 16, while surfing with friends, he was swept out to sea. Coast-guard was called and his family rushed to the site, but he emerged safe on his own 40 minutes later. In 1995, James introduced his sister Mary to television producer Alistair Donald, whom she would later marry. On 17 April 1998, in Tucson, Arizona, James, along with his father and sisters, was at his mother's side when she died from breast cancer, which had been diagnosed in 1995. Later that year, McCartney graduated from Bexhill College, near his home in East Sussex, where he pursued studies in A-level Art and Sculpture. James has played guitar and drums on some of his father's solo albums, including Flaming Pie (1997) and Driving Rain (2001), as well as co-writing a few songs. On Flaming Pie he has an electric guitar solo on the track "Heaven on a Sunday". On Driving Rain, he co-wrote the songs "Spinning On An Axis" and "Back In The Sunshine Again" with his father, and played percussion on the former track and guitar on the latter. He also plays lead guitar on his mother's posthumously released solo album, Wide Prairie (1998), which included tracks recorded privately over the previous twenty years. In 2004 he again left the McCartney family home and began living in a flat in Brighton, where he waited tables while he attended college and worked on his music. In 2005, he accompanied Paul during his 'US' Tour. Around 2008, he began working with David Kahne, his father, and a number of other musicians on recording his own music. He made his US performing debut with his own original solo material on 14 November 2009 at the Fairfield Arts & Convention Center, during the Fourth Annual David Lynch Weekend for World Peace and Meditation in Fairfield, Iowa. He performed under the pseudonym Light. Available Light was McCartney's first official release as both a performer and songwriter. The EP included four original songs composed by James as well as a cover of Neil Young's classic "Old Man". In addition to composing the songs and singing, he plays electric and acoustic guitar, mandolin, piano and bass on the recordings. Produced by David Kahne and Paul McCartney, the EP was recorded between Sussex, London and New York over the previous year, including Abbey Road Studios. He stated, "The music was inspired by The Beatles, Nirvana, The Cure, PJ Harvey, Radiohead—and all good music. It is basically rock n' roll, clean sounding and vocal. The words on the album refer to spirituality, love, family, trying to sort out one's life, and many other things." He previewed tracks from Available Light when he toured the UK for the first time in February and March 2010, though he at first performed under a pseudonym. The album was released electronically September 2010 on Blake Morgan's Engine Company Records, (now ECR Music Group) to positive reviews. Close At Hand, his second EP, was released in 2011. McCartney's The Complete EP Collection was released on 22 November 2011. The album combines the previous two EPs along with five new original tracks and two new covers. It is his first physical release, the two individual EPs being digital only. Like the EPs, it was produced by Paul McCartney and David Kahne, and is being released by Engine Company Records (now ECR Music Group). Rolling Stone called the opening track, "Angel," a "light and cheerful pop track." AntiMusic dubbed the release "whimsical and reflective, sharp-witted and affectionate. Full of smart, engaging pop songwriting." In a Rolling Stone song exclusive about the track New York Times, James notes he composed the main riff on a family trip when his father "... was just inches away from me." In April 2012, McCartney told a BBC interviewer that he had mooted the idea "a little bit" of forming a "next generation" version of the Beatles with Sean Lennon, Zak Starkey and Dhani Harrison. McCartney released his first album on 21 May 2013, titled Me. The album was supported by a tour of the US, starting on 6 April 2013. McCartney played at San Francisco's Outside Lands Music Festival in August 2013. McCartney recorded The Beatles' "Hello, Goodbye" with The Cure for the album The Art of McCartney, a collection of The Beatles and Paul McCartney solo covers. Like his elder half-sister Heather McCartney, James lives a relatively private life, unlike his sisters Stella, a fashion designer, and Mary, a photographer. James has a much younger half-sister, Beatrice Milly McCartney, born in 2003 to Paul and his second wife, Heather Mills. He has a vegetarian diet leaning towards veganism, and is an animal rights activist. In November 2012, James performed at a London benefit for the David Lynch Foundation, which his father also supports. McCartney practises Transcendental Meditation: "Transcendental Meditation plays a big role in my life as it has done for my father and the other Beatles. I meditate regularly—twice a day. ... I find that just 30 minutes of Transcendental Meditation refreshes me as if I had slept a few hours!" ^ a b c d Parker, Lyndsey (10 September 2010). "Apple Not Far from the Tree: Paul McCartney's Son to Release Debut EP". Yahoo Music News. Retrieved 20 November 2011. ^ a b c d Alison Boshoff. "WALRUSGUMBOOT'S ARCHIVED NEWS: Reluctant McCartney's life as a recluse". Archived from the original on 9 November 2007. Retrieved 18 March 2008. ^ Duffy, Thom (12 April 1997). "Album Track Previews". Billboard: 76. ^ "Wild Prairie". BBC. 3 September 1998. Retrieved 20 November 2011. ^ a b c "Macca's prodigal son: Why James McCartney is stepping into the spotlight". Daily Mail. London. 30 November 2007. Retrieved 20 November 2011. ^ "Shy James McCartney considering working with dad on own disc". Hello Magazine. 3 December 2007. Archived from the original on 19 September 2011. Retrieved 20 November 2011. ^ a b Marinucci, Steve (4 November 2009). "Paul McCartney's son says he's ready to follow in dad's footsteps". Beatles Examiner. Retrieved 20 November 2011. ^ a b c d "Paul McCartney's son hits the road". The Mirror. 2 March 2010. Retrieved 20 February 2010. ^ Price, Richard (3 March 2012). "Here comes the Son: Paul McCartney's daughters have embraced the limelight now his 34-year-old son steps out of the shadow". Daily Mail. London. ^ "James McCartney Releases Debut EP Available Light". Top 40 Charts. 9 August 2010. Retrieved 20 November 2011. ^ a b Friedman, Roger (21 September 2010). "Paul McCartney's Son, James, Releases First Album". Parade. Retrieved 20 November 2011. ^ Ottesen, Ida (March 2010). "James McCartney Plays Liverpool". New Beats Media. Retrieved 20 November 2011. ^ Weiss, David (19 September 2010). "James McCartney Releasing "Available Light": 5 Questions for David Kahne, Co-Producer & Mixer". SonicScoop. Retrieved 20 November 2011. ^ a b Weiss, David (1 August 2012). "Engine Company Records (NYC) Expands, Relaunches as ECR Music Group". SonicScoop. Retrieved 12 September 2012. ^ a b "James McCartney Biography". JamesMcCartney.com. Retrieved 20 November 2011. ^ a b c Fuentes, Catherine (20 October 2011). "Exclusive Song Premiere: James McCartney's Cheerful Pop Track 'Angel'". Rolling Stone. Retrieved 20 November 2011. ^ "James McCartney to Release two CD Set". AntiMusic. 21 October 2011. Retrieved 20 November 2011. ^ "Song Exclusive: James McCartney's 'New York Times': Hear a song from 'The Complete EP Collection'". 29 February 2012. ^ Youngs, Ian (3 April 2012). "Paul McCartney's son James on playing the Cavern Club". BBC News. ^ a b Lopez, Korina (7 February 2013). "James McCartney to release full album, go on tour". USA TODAY. Retrieved 10 February 2013. ^ a b "McCartney, Jr: meditation and vegetarianism". Archived from the original on 23 October 2013. Retrieved 23 October 2013.